Jesus speaks of judgment, mercy, and fidelity as the weightier matters of the law. (Mt 23:23) Setting these three together is essential for the right understanding of the more compact statement that mercy is better than sacrifice. (cf. Hos 6:6) Mercy cannot be rightly understood apart from judgment and fidelity. In writing about these three qualities of fidelity to the covenant I have been referring to the original Hebrew concepts that stand behind our English translations: misphat for judgment; chesed for mercy; emeth for fidelity. I have already written about mishpat as the capacity for discernment that every member of the covenant people needs to recognize the concrete demands of the covenant in all the complex and difficult situations of life. It is now time to turn to mercy or chesed. We tend to think of mercy as either feeling compassion for someone who is suffering and in need, or actually helping the person, performing a work of mercy. As a quality that characterizes fidelity to the covenant, the meaning is a bit subtler. We can start with the opposite. When Abraham goes to a foreign land with his wife Sarah he is afraid that there will be no fear of God in the land, so that seeing the beauty of his wife, the king will kill him in order to take his wife. (cf. Gen 20:11) We see a situation of radically unequal power that leaves one party in a vulnerable and disadvantaged situation. The vulnerable person is dependent, for his safety, on the more powerful person being restrained by something that will oblige him to justice. Ultimately, the only higher power of justice that is present everywhere and in all circumstances is God himself. So the man of chesed fearing God will never abuse his power, even if he is likely to be able to get away with it, even if no human being will ever know the difference, and take advantage of someone in their weakness and vulnerability. The man of chesed, however, goes a step further. He will even render assistance to that weak and vulnerable person, when there is no obligation to do so and when no one else will know the difference if he fails to do so. A vulnerable person is safe in the presence of a man of chesed. Chesed, which presupposes mishpat, has a keen awareness of and sensitivity to another person’s weakness and vulnerability. Chesed, we might say, above all recognizes and establishes the dignity of the person. An act of chesed then means more than writing out a check to a charitable organization or giving money to a beggar on the street, both of which can be done with very little personal interaction or personal engagement. These sorts of ‘charitable’ acts are sometimes little more than an emotional salve to a guilty conscience and are lacking in the mishpat that recognizes the truth of the need. Near the beginning of the ancient Christian writing the “Didache” we find the affirmation: “Let you alms sweat in your hands, until you know to whom you are giving.” (Didache 1.6) The sweating speaks of the time, restraint, and patience needed to exercise discernment or mishpat; “until you know” speaks of the act of mishpat. The man of chesed, then, lives in the presence of God, recognizes the dignity of others, is sensitive to their vulnerability, takes the time to know the person and the need, and so is capable of making a judgment about what help, if any, should be given. People who have experienced homelessness have said that one of the greatest sufferings of that condition is that people look right through you as though you didn’t even exist. That is not what the man of chesed does. Yet neither does the man of chesed waste his time with the scam artists who know how to work the system. What applies to the giving of material assistance also applies to forgiving offenses. Jesus’ statement that we must be ready to forgive an offending brother seven times seventy times presupposes a basic sincerity of repentance. (cf. Mt 18:22; Lk 17:3-4) Plenty of people have learned how to manipulate others and play the ‘forgiveness game’. When we fall for that trap our own sincerity is compromised when we say “I forgive you” out of a sense of obligation, while we live in denial about the ongoing hurt that arises from the manipulation. Without mishpat then there can be no chesed. Fr. Joseph Levine graduated from Thomas Aquinas College and after a long journey was ordained to the priesthood for the Diocese of Baker, Oregon. 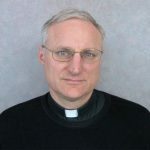 He currently serves as pastor of St. Peter Catholic Church in The Dalles on the Columbia River. Mass Facing the Tabernacle – By What Authority?